During the days leading up to Anna’s funeral, I was a bit numb. Joey and I both cried so much that we had sore, swollen eyelids. Joey was concerned that one of his might be infected, but it wasn’t. We put cold packs on our eyes to decrease the swelling so they wouldn’t feel so heavy. The second night at home, when the clock kept ticking but I couldn’t sleep, I snuck into Abby’s room. I chose a small Anna-size doll and cuddled up with her. Finally, my body was able to relax so that I could go to sleep. There was truly a physical ache, a need to tuck my Anna’s head underneath my chin and hold her to my chest. I wanted every detail of Anna’s funeral to be perfect and yet I hated even thinking about it. We sorted through photos to find the right ones for the program. I wrote the obituary. Joey talked to the two pastors involved. I ordered flowers to blanket the casket. I selected our clothing and made a quick run to the mall with Joey to get a few things we needed. On that Friday morning, the skies were grey, which made perfect sense to me. The air was remarkably thick and warm for a day in March. My mother had come to our house to help us get everyone ready. Josiah was dressed in blue-and-white striped seersucker pants with a thin yellow sweater vest. Abby wore a silky cream-colored dress with gems decorating the neckline. It was a fancy dress, and she was pleased with it. Joey wore a navy suit with a cheerful tie, which stood in contrast to my solid black maternity dress and heels. I remember thinking that we all just looked like we were going to church. Oh, how I wished that was all this was. Just another Sunday. Not a Friday. Not the day we were burying Anna. Josiah remained confused about Anna’s whereabouts. He could not separate a soul from a body in his mind. That morning, I read a portion of a book that talked about the body being a house, and I decided to have a talk with Josiah, using that analogy. “Josiah, you know how our friend Brandon lives in a house just across the street?” I asked. After Josiah expressed his concern about this–he did not want Brandon to move–he agreed that if he did, the house would still be there but Brandon would not. “That’s what happened to Anna. Anna had a little house here, and we call that her body,” I explained. I told Josiah that when Anna’s body quit working–when it died–she opened her eyes and God was standing there with His arms open wide. He didn’t take her. She went to Him after her body stopped working. He had some questions, but he seemed to understand the concept. I told him Anna left her house behind. She didn’t need it in heaven. God would give her a brand new one that was perfect. So today we were going to bury that little house Anna was stuck in. Anna was already in heaven with Jesus, so she didn’t need her old house. We all prayed together in the kids’ bathroom, right after teeth had been brushed and hair had been combed. As we drove to Flomaton, Josiah thinking we were burying a doll house and Abby curious about who would be there, I focused on just breathing. Joey tried to explain what the kids could expect at their first funeral. We tried to talk about heaven. Tried to spawn conversation about our feelings. Tried to make the day more meaningful without making it any more painful than it had to be. Some very special friends worked to bring beauty from the ashes of this day. When we arrived, we saw photos from our maternity shoot and Anna’s day sitting atop a baby blanket layed out on a table. Beautiful programs with our daughter’s photos and her obituary lay atop a podium with the guest book. Sprays of flowers reminded us of all those who were mourning with us. Many family members had already gathered around the dark green tent set up for the service. I really wasn’t sure what I was supposed to do. We were a little early. I didn’t know funeral protocol–or even etiquette. (Yes, I am admitting that at my own daughter’s funeral, I was concerned about what was “appropriate.” It is a sickness.) Anna’s casket was not under the tent yet. Joey wanted me to stay in the car and wait, but I just couldn’t. It felt wrong. 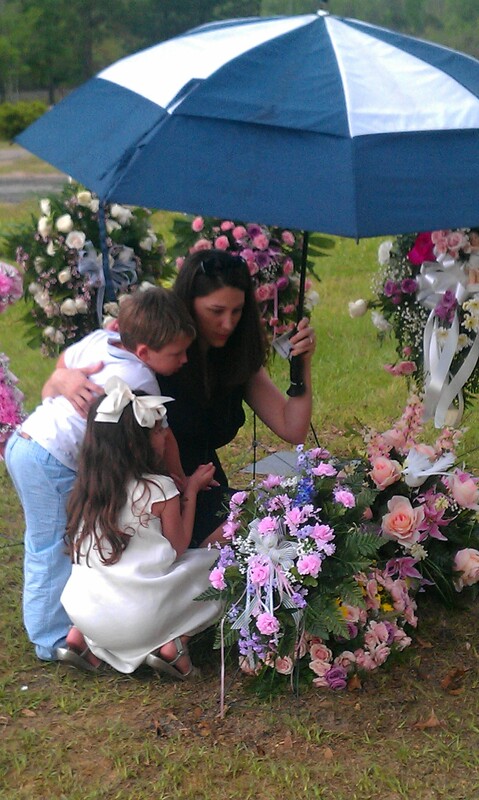 I got out and watched as a gentleman carried my baby girl from the hearse to the tent. I spoke to a few people as I made my way to her. Abby and Josiah sat in the cool van. Soon, we were all out and seated. I don’t really remember how it all happened. I just remember standing up and greeting people as they came by Anna’s tiny casket, a simple wood casket wrapped in a white eyelet fabric. And then I remember us all being there. I turned around to my niece Maesey and asked her to come sit beside Abby. I thought Abby might need her best friend’s hand to hold. My two cousins, Kayla and DeAnna, played some hymns Joey and I had chosen in two-part harmony on their fiddles. Beautiful. Our pastor, Bro. David, and our former pastor, Bro. Dustin, gave us scripture and hope to which we could cling. Joey and I tried to focus on these important messages. But burial is so hard. I understand why people say that funerals are for the living, and I can see how the celebration of a life would bring joy to some. In our situation, though, I would be lying to say that the funeral somehow brought me peace and helped me let go. I was exhausted, wearing control-top pantyhose, sweating, worrying about how Josiah was running back and forth from his grandparents to us, trying to figure out why Abby was all slumped over in her seat (I later found out the whole thing was giving her a stomachache), and was acutely aware that throughout all of this, everyone was looking at me and Joey, the parents who had lost their child. We so appreciated the love poured out on us, but it was still an agonizing day. At the end of the service, our family knelt down in front of the casket and tore the blooms off of a yellow mum Joey had brought. 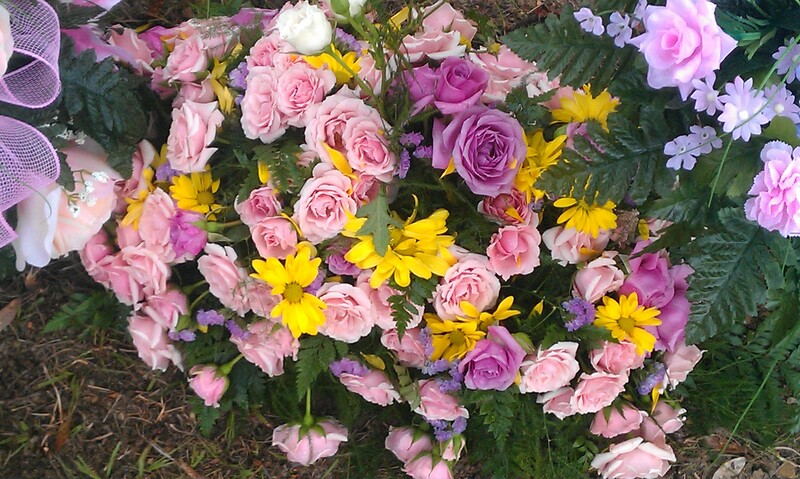 We pushed the stems into the thick blanket of tight pale pink and lavender roses lying atop Anna’s casket. In that moment, I wished I had asked for a light and airy spray to top the casket rather than a traditional blanket. I started pulling out the small roses that reminded me of my wedding day–a day I knew would never come for my little Anna–and replacing them with the bright, cheery flowers. Abby and Josiah haphazardly stuck the yellow blooms throughout the arrangement. I liked the way it looked. Instead of looking like a professional spray, it looked more like a bouquet my children might have gathered. I silently cried over her casket and could not quit touching it, straightening things, wanting to change something. Joey saw my desperation and quietly said, “Let’s go.” He helped me up from my kneeling position and I sat back down in my chair. The ceremony had concluded. This really was happening, and I was powerless to change it. Standing, I began greeting people, thanking them for coming. I tried to make it around to each person, although I am sure I missed some. I was grateful for their presence, grateful that they wanted to honor our Anna by coming. After the service, we drove over to Joey’s home church, First Baptist Flomaton. A bountiful meal had been graciously prepared for our large extended family. We sat together and talked. Joey made his way around the room, speaking to everyone so that I didn’t feel that I had to. Some of the conversations I had with people that day I will always treasure. I was reminded of God’s faithfulness to us, over and over. He never looked away. He was always there with us, even as we buried our daughter. After the meal, we went back to the gravesite. I realized we did not have any photos of the flowers people had sent, so Joey brought his camera phone. 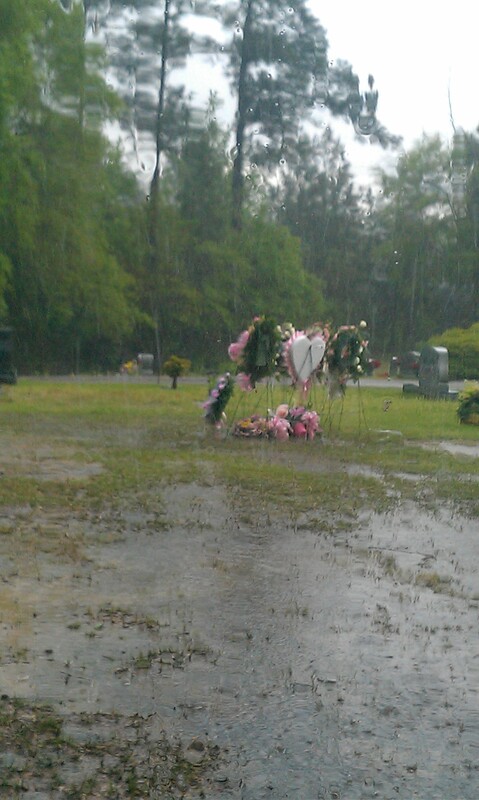 Our family walked out and looked at the little spot where Anna was buried. It seemed impossible that we were just going to leave her here. It had begun to drizzle as we got out of the van, and as we walked back, the rain started to pour. We drove around the cemetery and then parked, looking again at the gravesite before leaving. The rain was coming down so hard. It felt like God was crying with us. Our children were so confused, rightfully so. Abby said, “If Anna’s in heaven, why are we so sad?” Joey affirmed Abby, telling her that we were glad Anna was in heaven but we just missed her. Josiah said, “Ugh! Why didn’t God just take us all to heaven at the same time? That’s what I would do if I was God!” I told him that was a great idea, but God had a different plan, and we had to trust that His plan was best. Both of our children were sad. Deeply. Powerfully. Twistingly. I had underestimated how that would play itself out. Josiah was angry, sometimes physically aggressive, stubborn, and obstinate, but he was willing to talk about it. Abby was physically impacted in several ways. She had stomach aches; she gave tight, squeezing, repeated hugs (sometimes ten at a time, just as hard as she could); she began biting things for comfort; she started talking like a baby and wanted to pretend to be one. And although she was willing to talk about it, she did not bring the subject up because she did not want to upset us, even though we repeatedly told her we wanted her to talk to us about it. We jumped into what seemed like a flooding reality. Losing Anna was heartbreaking. But I was determined that we would not lose Abby’s and Josiah’s hearts. We were going to have to summon up the strength to wade through this with our children. Any strength that Joey and I had remaining after burying our daughter wasn’t going to be good enough, and we figured that out pretty quickly. We needed prayer, support, and power that only our God could supply. So we turned to Him, again and again, asking for patience, wisdom, and energy. Short little prayers. Desperate little prayers. And honestly, sometimes I didn’t turn to God. Sometimes I didn’t want to talk to Him. But when I was at the end of my strength and I had nothing left, He always waited for me, arms open wide. Anna’s burial day was, in a way, an ending. But in other ways, it was a beginning. Anna’s short life story is woven into ours. Joey and I are changed because we had the honor of being her Mama and Daddy. And Anna is a part of who Abby and Josiah are becoming. I trust Romans 8:28. I have to trust. 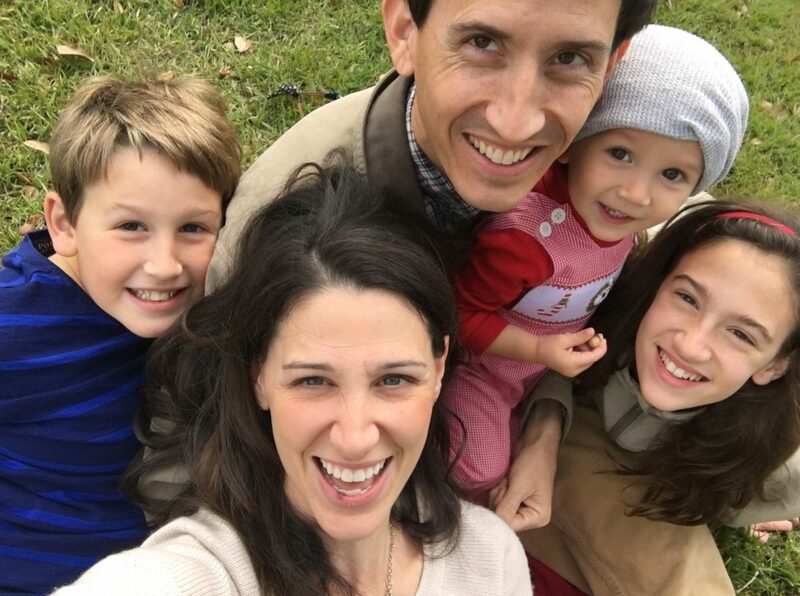 I trust that one day my children will see how God brought good out of this–how with Anna’s life, God brought color, texture and an increased depth to their souls. He is the Creator of all masterpieces, even the ones we sometimes mistakenly think belong to us.